HomeCoffee Mill Guns? Or Woodruff Guns? What did Battery K, 1st Illinois tote on Grierson’s Raid? Coffee Mill Guns? Or Woodruff Guns? What did Battery K, 1st Illinois tote on Grierson’s Raid? Battery K: Paducah, Kentucky with ten Union Repeating Guns (or the Agar “coffee mill” gun). This is intriguing, as we most identify the use of this weapon in the Eastern Theater. With the length of the overall post covering the 1st Illinois, I didn’t wish to delve into interpretation of the entry. The intent is to present the summaries “as is” from the start, with obvious corrections and questions offered. From there, where the correction or question requires more discussion, offer that as a follow up. Well… here’s a follow up! You might wish to click on the image above and open in Flickr to enlarge to see the fine details. The line to follow across is 47. The column in question is fourth from the right, or the first among the “Miscellaneous” sub-heading. The column has a printed, not hand-written, name – “Union repeating gun.” The summary indicates Battery K had ten of these on hand. While these machine gun type weapons are a bit out of my lane as they are not artillery “stuff.” So I am not claiming to be an expert on their design, manufacture, and use. But as these are “ordnance,” I’ve run across a lot of interesting source references. Over the years, the most interesting is the use of these Coffee Mill Guns in Loudoun County during the spring of 1862. So while rare, the Coffee Mill Guns saw some use in the Eastern Theater. Not counting the entry for Battery K, scant few accounts reference the use of these weapons in the western theater. The only one that comes to mind is an account indicating the Federal riverine fleet received a few for use on gunboats. Now keep in mind the general process for getting the numbers in the columns. The battery in the field would complete a return and send that to the Ordnance Department in Washington. The return was reviewed in Washington. A clerk (or team of clerks, more likely) would extract the data for entry into a very large ledger. That became the “summary.” And let me stress again, that was the “quick and simple” explanation here. Bottom line, when we apply that process, is that clerks back in Washington were trying to put numbers into a standard, very detailed, yet rigid entry form. There was not a lot of room for “other” within the form’s columns. Yes there are blank columns in which we see hand written column headers. But for the most part, it seems the clerks sought to use the printed entry columns. What we see here, I think is an attempt to adapt the printed columns to contend with some out of the ordinary data entry need. In this case, the entry for Battery K puts us in front of a lot of questions. Readers may recall that within a few months of the report (which was apparently filed in December 1862), Battery K had left Paducah, Kentucky for Memphis, Tennessee. In April 1863 the battery was selected for a special mission. Along with the 6th and 7th Illinois and 2nd Iowa Cavalry, Battery K was part of a raid led by (then) Colonel Benjamin Grierson (which you might have seen dramatized in a movie…). And on that raid, the men of Battery K toted along a set (six, though some say four) of 2-pdr Woodruff light cannons. The Woodruff gun is another thread that deserves a separate post (if not several). Allow me to give the short version here for brevity. James Woodruff of Quincy, Illinois came up with the idea for a very light artillery piece that could be pulled by men if the horses were disabled. The gun measured three feet in length and weighed just over 250 pounds. The gun’s bore was 2 ⅛, and was intended to use canister (seven one ounce lead balls) or small caliber solid shot (the caliber closely matching 12-pdr grape-shot sizes). Later in the war a solid projectile resembling a large mine-ball was produced for the Woodruff. Cited range for the gun was 700 yards. The Greenleaf Foundry in Quincy made six of these guns for local defense. The Ordnance Department, under some high level political pressure, ordered thirty, complete with carriages and limbers. Assuming that was the full production run, these weapons end up referenced in a surprising number of locations. Aside from use on Grierson’s Raid, the weapons are mentioned in use around Memphis, and still later in Missouri at Pilot Knob. So where does that have us with respect to Battery K? Well let’s go with “Door Number 1”: The battery had Coffee Mill Guns at Paducah, then were issued Woodruff Guns sometime in the winter or spring of 1863, prior to Grierson’s Raid. But I’d counter that the Ordnance Department kept listing Coffee Mill Guns well into 1863. Why wouldn’t they have substituted a hand written column for the Woodruff Guns in order to ensure the integrity of the entry? OK, “Door Number 2”: Battery K had both Coffee Mill Guns and Woodruff Guns through the reporting period, but only the machine guns were tallied. Well, that might sound plausible. But such would require more men than Battery K was authorized. Now “Door Number 3”: Battery K had Woodruff Guns at Paducah. The clerk performing the entries didn’t find an easy place to put the tallies. Perhaps he was confused as to the nomenclature. 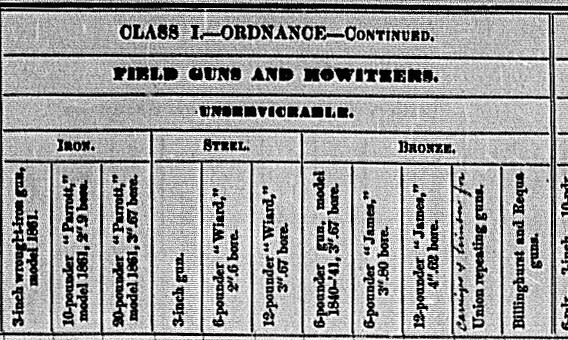 At any rate, the tally of ten weapons in the “Union repeating gun” column are actually “Woodruff Guns.” Likewise, lacking a column to indicate a quantity of non-standard carriages and limbers, the clerk used the repeating gun’s unservicable column. My thinking is we have a case of Number 3. All of this, of course, brings the observation that all these entries in the summaries need be taken with a grain of salt. And such is why I offer “as is” to be used in conjunction with other sources. One last note on Battery K, as they were certainly not just a collection of cannons (or machine guns) and equipment. Captain Jason B. Smith organized and commanded the battery. Smith was born in South Carolina in 1805, but his family moved west during his teenage years. Pre-war records indicate he lived in Pope and Johnson Counties, in the southern part of Illinois. He was a blacksmith and a preacher – two avocations that some would argue go together… and perhaps two professions that provide a good skill-set for a battery commander in war. 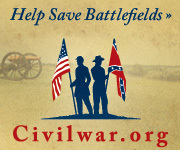 I never found info about the repeating guns possibly at Harpers Ferry. Since there was no mention of them being captured by Jackson I guess they were not there.